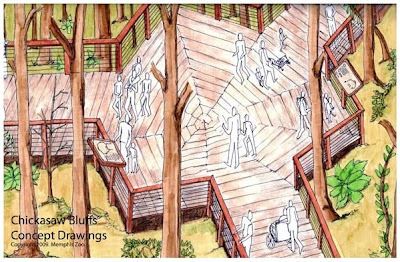 Our favorite Memphis Zoo spokesmodel sent an email Friday afternoon to tell us about the Zoo's concept drawings for the proposed Chickasaw Bluffs exhibit. This marked the very first time the Zoo has initiated contact with CPOP, ever, so you can imagine how excited everyone was. I'm thinking of framing it! 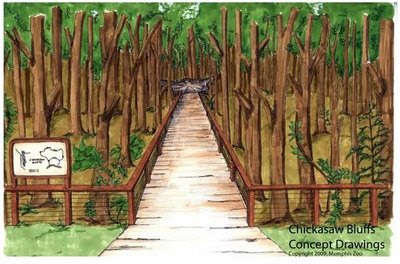 The Zoo has just posted some artist concepts for the Chickasaw Bluffs trail on our Web site. These are not finished architectural plans. 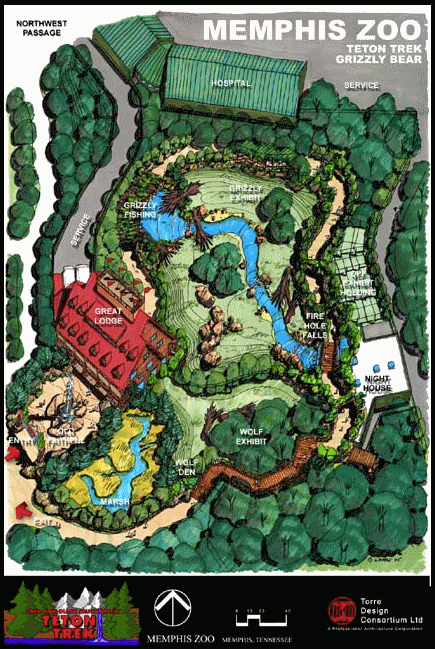 Instead, these drawings are meant to illustrate the intent of the trail and share the Zoo's vision with our community. Please share this link with others. We've still got a lot of work to do with the results from the GIS tree survey to provide a much more detailed scope of the project, but we wanted to send out materials as we had them available. Adding to the excitement, the Zoo's President/CEO/Emperor Chuck Brady answered a few questions about the proposed Chickasaw Bluffs exhibit in last week's Memphis News and acknowledged that "public concern" has persuaded the Zoo to "go very carefully in step-wise fashion and then get input." 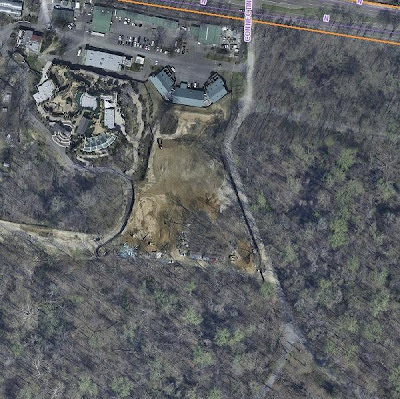 This would be a HUGE paradigm shift for the Memphis Zoo. Last year when the Zoo clearcut four acres of old-growth forest to build Teton Trek, they didn't ask for public input on their plan. They just fired up the bulldozers and did it. We hope the Zoo's leaders have learned from their past mistakes and changed their ways, but we're not convinced yet. 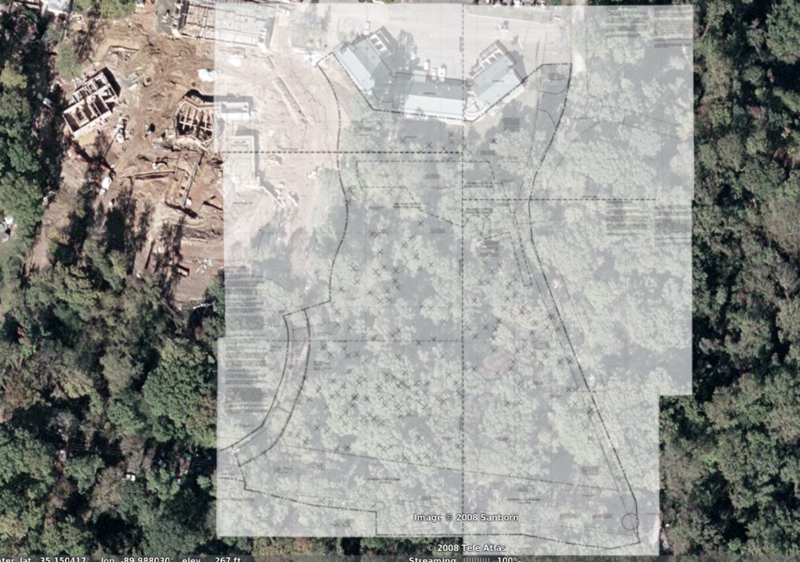 There's a vital element missing from their concept drawings for the Chickasaw Bluffs exhibit. 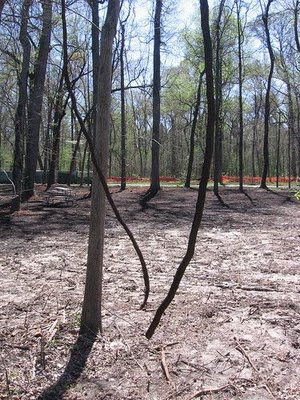 Where'd our forest understory go? No festooning grapevines? No celandine poppies or mayapples? No lush layers of wild ginger, knotweed, snakeroot, hydrangea, spicebush, hazelnut and pawpaw? 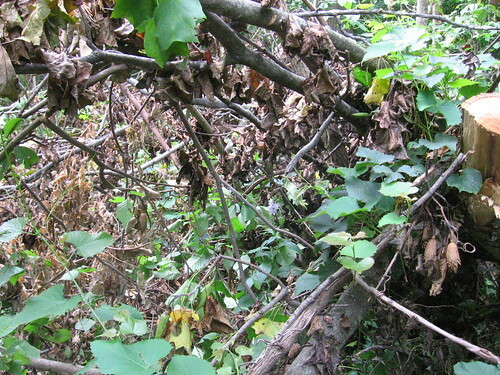 No fungus-covered fallen logs? Sure, these are just concept drawings. 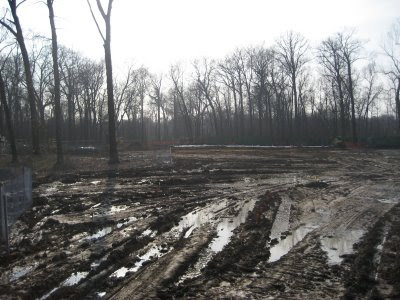 But given the fact that the Zoo has been steadily mowing and chainsawing and scraping the understory of the Old Forest down to bare dirt (a few examples here, here, here, and most recently here) we think it's a disturbing omission. 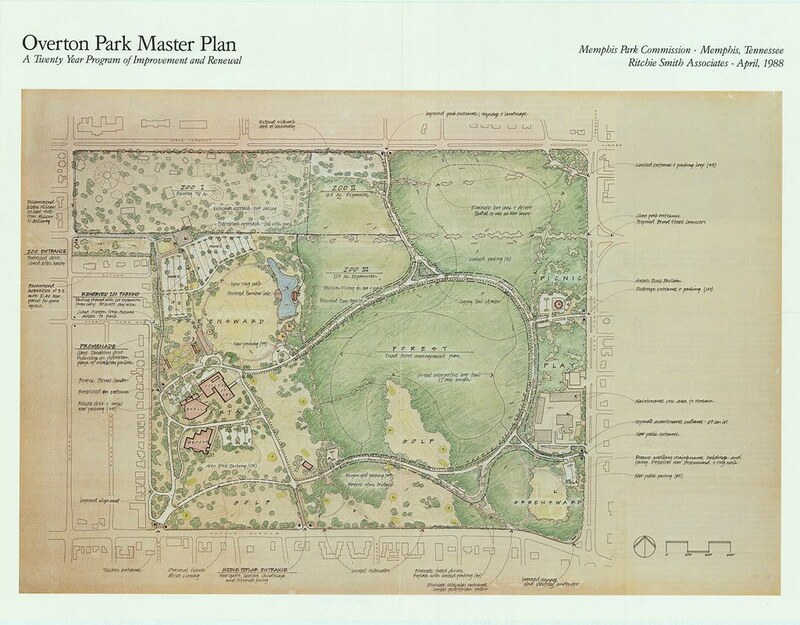 It's even more disturbing when you consider the fact that the Memphis Zoo refused to allow botanist Tom Heineke to include the 17 fenced acres in the year-long Old Forest plant survey that was commissioned last summer by Memphis Park Services. But we recently asked a few more questions and discovered that the Zoo's plant survey only includes trees and invasive non-native species. 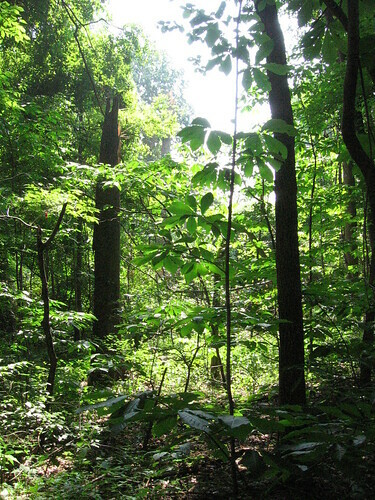 In other words, the Zoo's plant survey does not include any of the native understory species that make up the vast majority of the Old Forest's plant life. 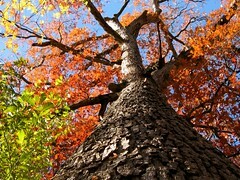 How many times must we repeat that our forest is not defined by its trees alone? Yes, it is truly amazing that the Old Forest contains many individual trees that were alive before the City of Memphis was founded. But isn't it also amazing that those trees are rooted in nine vertical feet of loam, built up over the past 10,000 years? And that this rich soil also supports several hundred species of wildflowers, shrubs, and other small plants? 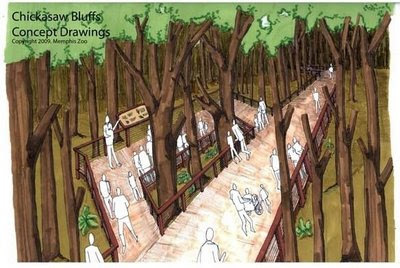 The Memphis Zoo's website says the proposed boardwalk trail will "bring more people into the forest while preserving its native plants and ecosystem" and "educate our community of [sic] the forest's history and awe-inspiring beauty." 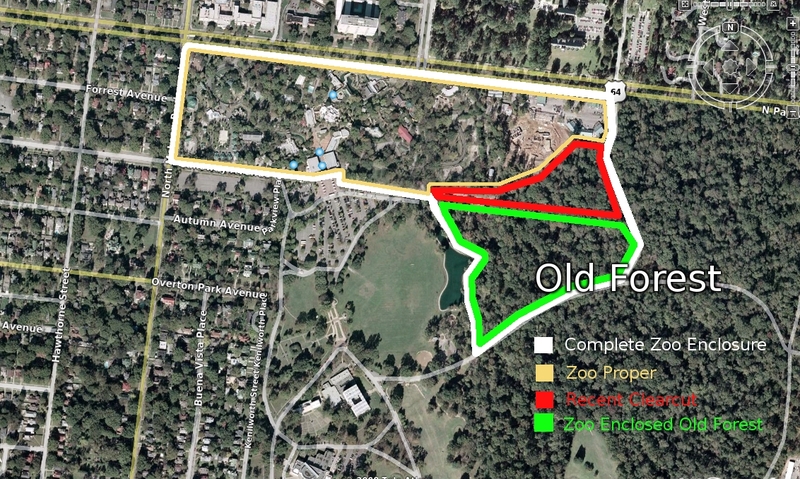 If the Zoo's leaders really want to preserve native plants and educate our community about them, why did they refuse to include the 17 acres in the Old Forest plant survey? Do they intend to hire a botanist to do a separate survey of "their" understory? Or do they still think big trees are the only plants that matter? We will usually tell you on our Old Forest hikes that you should keep hiking because the seasons' flow changes the Forest so much. What you see this month will almost certainly look much different next month and incredibly different 6 months from now. Sometimes the changes aren't by season or human. 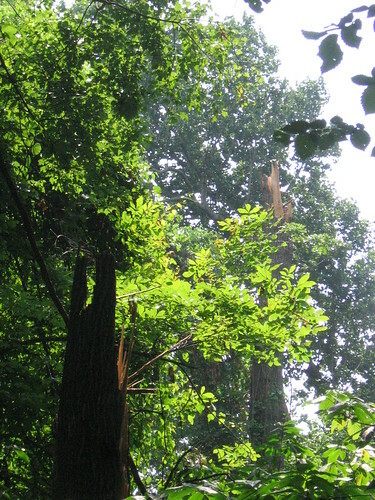 The huge storm that passed over Memphis on June 12, 2009, knocked down a few trees and changed the feel of their spots in the Forest. Crowns fell, understory was squashed and lots of direct sun and skylight appeared on the floor at angles and intensities not seen before at those spots. Here are the broken edges of a couple of trees that left a hole when they broke. With the crashing came their payloads, the beautiful vines that hang from and cling to the great trees of the Old Forest. I've always loved these vines. 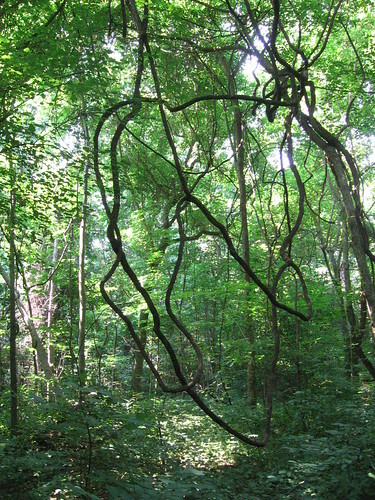 But it's only recently that I found out that most of the hangers are grapevines*, which is very cool. They wrap themselves around the growing trees and hitch a ride to the top of the canopy for the sunlight that their grapes need. For that reason (and because fast-moving, vertically-advantaged wild'uns eat them quick) you don't see the actual grapes much on the Forest floor. However, when the tops off of a few great trees came down during the storm, their grape payloads came with them. On this month's "Second Saturday" nature hike I saw my first Overton Park grapes. 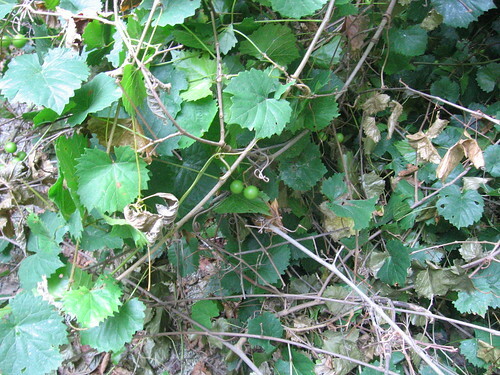 *the clingers are usually poison ivy, which is also very cool if you're a bird that likes their berries or a human that keeps a healthy distance. Midsummer is prime time for grapes. Join one of our regular hikes if you want a closer look. And a taste, if you're lucky! Our next hike is tomorrow morning: Sunday, July 26. We meet at 10:00am on the Lick Creek bridge next to the Rainbow Lake parking lot. Remember back in March, when the City of Memphis engineering staff consulted their Magic 8-Ball and announced that an 18-foot-deep stormwater detention basin would be the perfect fit for Overton Park's historic Greensward? The Memphis Zoo was okay with this plan once the City engineers proved there'd still be enough space for the Zoo's overflow parking. 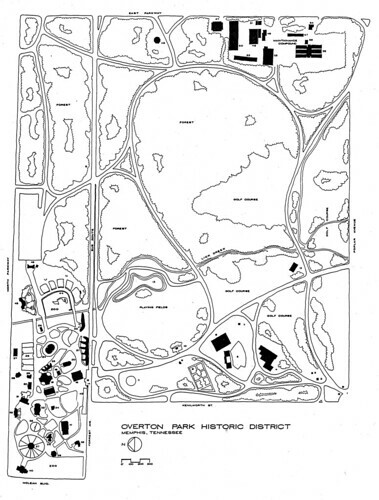 But most of the people who actually like Overton Park quickly agreed that the City's detention basin concept was flat-out insane, and a fervent grassroots coalition got together to Save the Greensward. 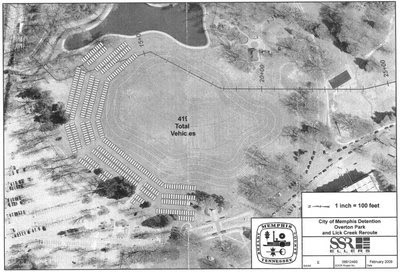 Round about the same time, the Memphis Zoo chose to convert several acres of the irreplaceable understory of Overton Park's old-growth forest into a mulched and sodded picnic area. 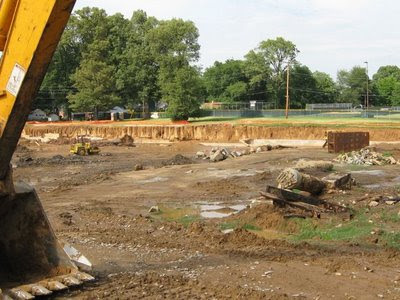 As CPOP documented, the Memphis Zoo broke the law by failing to apply for the stormwater construction permit that every other land-clearing operation (larger than one acre) is legally required to obtain. We met with the City of Memphis and Tennessee Department of Environment & Conservation (TDEC) and asked that the law be fairly applied, but, given the end result, we have to say that the Memphis Zoo got a free pass from the City and TDEC in this case. Now fast forward to today. If you enjoy visiting Overton Park and/or live in the Lenox, East End, or Vollentine-Evergreen neighborhoods, you've probably noticed that Lenox Bayou and Lick Creek have been mud-choked and nasty-smelling for the past month or so. Why? 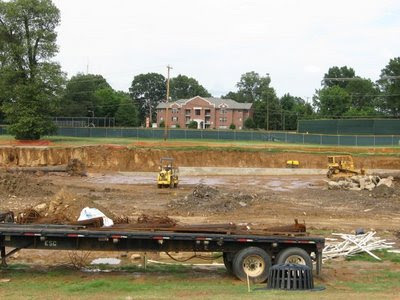 Because the fine engineers of the City of Memphis are digging a stormwater detention basin on the campus of Christian Brothers University, near the top of the Lenox Bayou watershed, and they are making almost no attempt (as of today) to comply with the applicable local and State laws regarding erosion control on construction sites. And guess what? 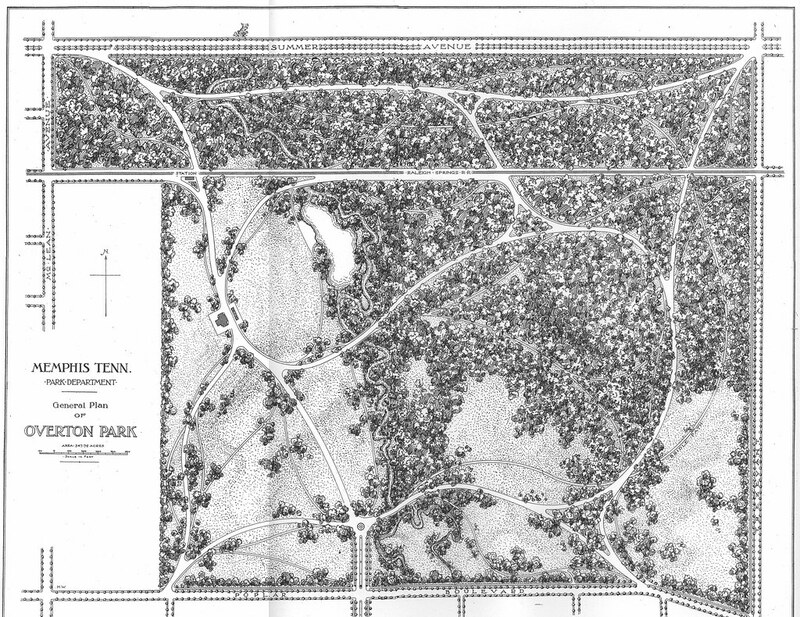 This happens to be the very same 8-foot-deep detention basin that City Engineering chief Wain Gaskins cited as a shining example when he claimed that Overton Park visitors wouldn't even notice an 18-foot-deep basin in the Greensward. 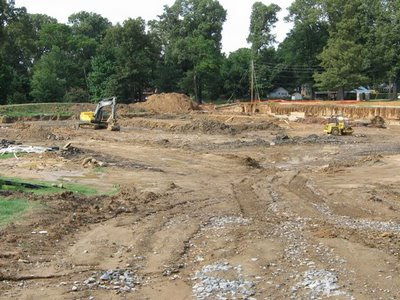 For the past month, the City's stormwater inspectors have ignored citizen complaints about the huge amounts of mud and other pollutants that are being discharged into Lenox Bayou and Lick Creek from this City construction project. The Memphis Zoo and the City's engineering division both seem to enjoy operating above the law when it comes to stormwater regulations. We think it's time for everyone to come back down to earth.